Location: Rosscarbery in County Cork, Ireland. Notes: Coppingers Court is a ruined four storey fortified house dating from 1616, situated on private property approximately half a mile (0.8km) from the sea. 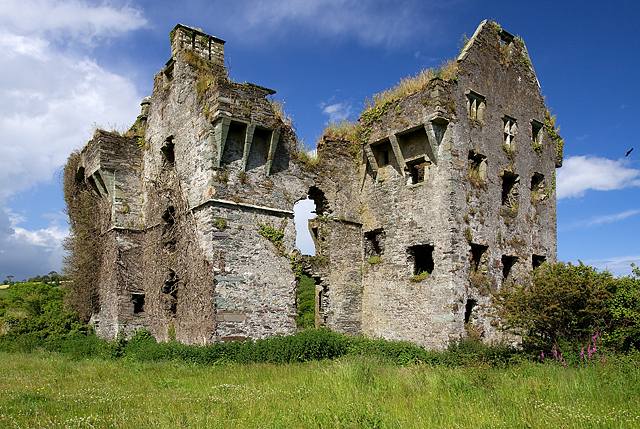 It was built by Sir Walter Coppinger and located in Ballyvireen valley, west of Rosscarbery in County Cork Ireland. The house has a rectangular centre flanked by two wings on the east and west, resulting in a total of 9 gables. Coppinger's Court is built in the Elizabethan style, as was fashionable in Ireland in the 17th century. Older style fortified towers and castles gave way to more comfortable, warmer and better-lit fortified houses with innovations such as wooden stairs, better lighting and more rooms. After the rebellion in 1641 when a number of these newer style houses were burned and destroyed, their popularity waned. At the time, Coppinger Court was said to be one of the finest examples of fortified house in its day, and was said to have "a chimney for every month, a door for every week and a window for every day of the year".